The original band of Rebet asker established in 1990, dedicated to the research of rebetiko, staying faithful to the spirit and intentions of their creators. Rebetiko is the folk song of the period when Greeks have been the productive toiler’s nation. It has been gradually modified since 1955 as all the other west nations to a nation of consumers that is a nation which actually consumes more than it can produce. There’s a difference-concerning the scale of values, songs, love, affairs, family matters, education and moral standard-between those who struggle for a living and those who play upon others. De facto it is bread-winner’s right to change the world, while he undoubtedly feels unpriviledged having to feed both himself and the others, in the meantime the consumer gives all in favor of increasing his forever income. There are toiler societies being sunk into poor passiveness, still waiting for better days, while others have been resisted and that is how modern civilization has been given birth. It was only the folk song of that period that has widely formed this specific bread-winners’ resistance while neither political policies nor the rest types of art have ever contributed in that so called conventional rebetiko. When bread-winners act they lead both to ”social holocaust” and attempts to build the “differently” in the meantime consumers lead to a constant renounce from essential human attributes, to hypocricy and cretinism. This is what the Greek inflamed young generation realized right after the 1974 dictatorship. In due time young people try to resist an “overwhelmed fatty lifestyle” that consumerism has eventually created following at the same time alternative paths. However, this is how young people have started being in contact with the resistant values of previous generations just the time when the revival of rebetiko and modern songs-which are in step with it-take place. Rebet askers rise through this fluid state in 1990 growing the idea that rebetiko and its corresponding lifestyle, as this of disinterest towards money, the undermining of lower middle-class family standards, the disobedience to propelled social patterns, the imposing way of entertainment, but above all the cultivation of a resistant way of living is the most enjoyable way to have a worthwile life into an increasingly non deserving world. So beyond that close scrutiny of rebetik songs and their successors, their lyrics, biographies and class conflicts concerning the folk song, we keep trying to be faithful to the lifestyle-against all odds-as this is the resistance that grows civilization, anything irrelevant is “consumer bubbles” and develops a bad life. More over, this is all we can offer to young Fellow-countrymen all around Europe and this is what we want to achieve as rebet askers through our repeated collaborations for years. Initially formed by Leonidas Kioussis, Sotiris Karalis, Yannis Kobotis, George Sinos and Marenia Stathakou.. We started as Rebet asker in 1990 during –an area occupation-performances so as to save ”Fix factory” from demolition and become a culture centre. Also with Alexantros Metaxas, and Aristea Skoulikariti we’ ve been performing in clubs and taverns where rebetiko is requested in various synthesis, such as “Efimero”, ”Palia Markiza”, ”Stoa athanaton”, ”Hobbo”, ”Methystanes”, ”Morfi”, ”Moudiano”, Afaneis”, ”Taki 13”, ”Omar”, ”El Kamino” and so on we have participated as artists in various area occupations and social protests in order to protect these green areas from building them up like Fix, Patmou- Karavia street, Agathoupoleos, University of Athens, Kypseli town market, Drakopoulou villa and many others. We’ve also been performing at the provinces on islands and cultural clubs where rebetiko has been asked Karpenisi, Gargaliani, Volos, Thassaloniki, Meliki, Nafpaktos, Kiato, Korinthos, Chalkida, Istiea, Kamena Vourla, Ermioni, Kalamata, Karistos, Naxos, Paros Santorini, Mikonos, Shinousa, Koufonisia, Folegantros, Samos, Ikaria, Gaudos and many places in Crete. 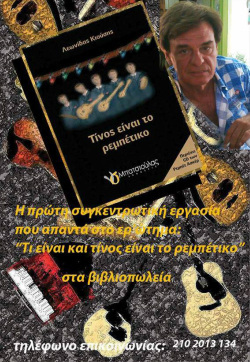 An addition to the artists has come with the presence of Thodoris Pappas (Bouzouki), Mihalis Panidis (kitare), George Mitsiou, (bouzouki-voice) Nikos Bouras, (baglamas-voice) and George (Kitare-lagoute), Dimitris (bouzouki), Lambros (klarinete-percation) Aggelopoulos, Yannis Litainas (kitare-voice) Spiros Georgiadis (oud), George Stogiorgis (kanonaki), Stefanos (santouri), Eleftheria (bedir, daire) and Christina bethani (voice). In this time 1999 we made the first cd with olds and owns sogs. This is the way we have started and continued the spread of rebetiko abroad - to Instabul for some months at Akdenisli club, being also on TNT-6 of Turkish TV, in Egypt, in the Grand desert Festival of Maroco, in Vienna at the European festival in bonor of the president of Venezouela and Bolivia Tsaves and Morales”, visit and finally at Marseille, for the Eastern fiesta called “fiesta of eggs” and the club Paradox. Also we have been teaching-at the same time-rebetiko, musical instruments and singing to lots of young and old people, always in a traditional way (totally different from Music Academies teaching methods) to all those who are pretty much interested in rebetiko .Conclusively many of these people have been incorporated into Rebet asker while others keep going in other grounds of Greece. Finally the Mayor of Athens has recently promised us a residence transfer to host our Music School.